The Body Champ BRB2866 is one of the newer models from this manufacturer for 2018. 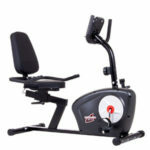 It is a recumbent bike within the same range of features as the Efitment RB034 or the Body Xtreme BXF003. It’s a light-capacity trainer made for home use. However, so far it has benefited from a fair amount of positive reviews from users. The Body Champ BRB2866 features a steel frame, with a one-piece longitudinal base bar. Its seat base and seat assembly are rated for a weight capacity of 250 lbs (113 kg), which is pretty fair for a home-use recumbent bike. However, the front covers of the drive and resistance elements are made of durable ABS material. The unit isn’t extremely large. Its footprint is only 43″L x 20″W (109 x 51 cm), but with the seat extended all the way back the unit will gain a few extra inches in length. This being said, it is recommended to assign a usage area for it of at least 70″ x 50″ (178 x 127 cm). The fully assembled bike isn’t too heavy. It weighs approx. 53 lbs (~24 kg). This means it can easily be assembled and carried by one person. Plus, its front base is equipped with transport rollers which ease its relocation. All the steel parts within the frame are coated with a corrosion-resistant paint. The color used is black, this being the only color available for this bike. The Body Champ BRB2866 is equipped with a seat that excels in comfort factors. To begin with, both its backrest and bottom pad are equipped with thick layers of foam cushioning, approx. 2″ (5 cm) at their thickest points. They both feature a durable, double-stitched vinyl upholstery which is also perspiration proof. The whole seat assembly is adjustable. You can slide it forward or backward on its rail. It only offers several inches of travel, but it should be enough to accommodate users between 5’0″ and 6’0″ (153 – 183 cm). 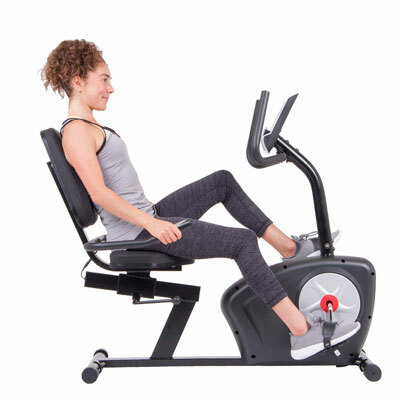 Taller persons should also be able to use this exercise bike, but they may not benefit from a complete leg extension. Also, as we’ve mentioned above, the seat assembly along with its base should be able to support users up to 250 lbs (113 kg) with no problem. The seat adjustment system uses a lever with its handle on the right side of the user. By pressing the handle you can easily unlock it and adjust its position while being seated. You don’t have to stand up as for bikes that have a knob or pop-pin based adjustment system, such as the older model, Body Champ BRB852. 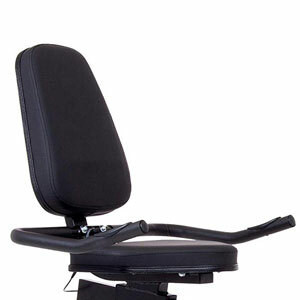 The backrest cannot be adjusted independently from the seat. Also, it does not recline. Its backbone is durable enough to provide a firm and healthy lumbar support. 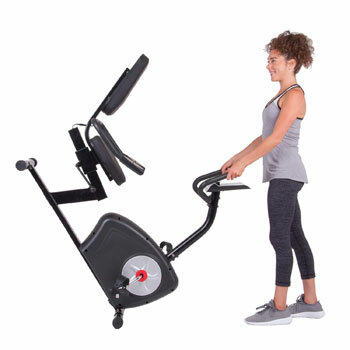 This Body Champ exercise bike is equipped with two sets of handlebars. One is attached to the seat, the other to the front mast. The seat handlebars are equipped with metallic pulse sensors. The distance between them is approx. 18″ (46 cm). They’re also slightly curved up at the front to provide a more comfortable grip. The front handlebars have a curved-up design, providing a front parallel grip. They do not have pulse sensors. The front mast is slightly curved towards the user. Therefore, the bike also provides a pretty comfortable upright posture, if you want to use the front handlebars. Both sets of handlebars have rubberized grips for optimal comfort. They are non-adjustable. However, since the seat handlebars attach directly to the seat frame, they will move along with the seat on its rail when you adjust its position. 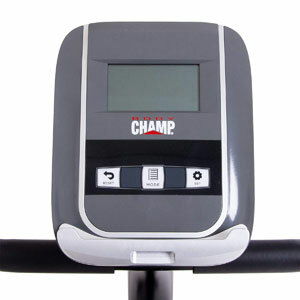 The Body Champ BRB2866 features a manual magnetic resistance system. This being said, the bike does not need to be connected to a power source. Also, the console does not play any role in the resistance adjustment. The unit’s resistance system consists of an internal magnetic brake which is attached to the knob on the front mast. There are 8 levels of resistance marked on this knob from left to right. So, by turning it clockwise, the internal brake will move closer to the bike’s flywheel, generating more resistance. As a general idea, the bike does not provide an extreme pedal tension, even if the 8th level is selected. It’s a bike made for light to medium intensity workouts at best. But nonetheless, it’s a great trainer for maintaining your cardiovascular health, tone muscles and even lose some weight. The bike’s drive system uses a heavy-duty rubber belt. Therefore, its internal drive does not need any lubrication. It also delivers a very smooth and quiet motion. The weight of the internal flywheel is not specified. 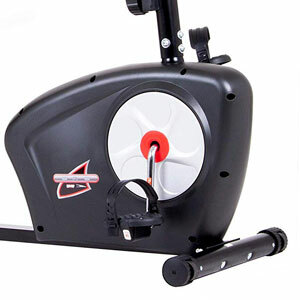 But since it’s a light-capacity exercise bike, its flywheel probably doesn’t weigh more than 10 lbs (4.5 kg). It is, though, a perimeter-weighted flywheel, designed to provide a more consistent momentum, and a steady pedaling feel. It’s also bi-directional; in other words, it gives you the possibility to pedal in reverse if you want. Finally, the bike’s crankset is fairly durable, equipped with solid steel crank arms. The pedals feature a weighted design so that they always turn face-up if you remove your feet from them. They have a textured surface for a better footwear grip, and also have adjustable straps. The fitness meter included with this Body Champ exercise bike features an LCD display which tracks time, distance, total distance, speed, calories, and pulse. The calorie reading is not too accurate, though, since there is no option for you to input your current weight and height. It’s only based on the RPM input. Also, the unit is not telemetric, so it cannot communicate with a wireless HR chest strap. It can only track your pulse via the sensors integrated into the seat handlebars. The meter unit is not compatible with any online fitness apps, nor it has any preset fitness programs. However, it does offer goal settings for time, distance, and calories. You can select a value for any of these metrics and it will begin to countdown from the selected value until it reaches zero. A tablet holder is also integrated into the console. This accessory is large enough to accommodate any type of tablet. However, a tablet placed on it will cover the console display. The base part of the frame along with the drive and resistance elements comes pre-assembled; the flywheel, crank, belt, and magnetic brake are already covered by the two ABS side shrouds. Therefore, you only need to assemble the seat, attach the front mast, the handlebars, the exercise, meter, the pedals, and the two base stabilizers. The manual provides excellent assembly instructions and a basic toolkit for the task is included. This being said, the whole process shouldn’t take more than 30-40 minutes. A tablet placed on the media holder will cover the console controls and partially the display. The Body Champ BRB2866 is a light-capacity recumbent exercise bike designed for home use. It is equipped with a standard magnetic resistance system offering 8 levels of adjustment. It offers an excellent level of comfort with a thickly padded seat and backrest. It also includes an exercise meter which can track your main workout stats and also gives you the possibility to set up target goals for time, calories, and distance. So, as a final conclusion, it’s an excellent bike for the price, great for light to medium-intensity cardio workouts, recovery training, muscle toning, and even weight loss.